Expert advice on building a campaign, from tips on world building to adventure and campaign construction. 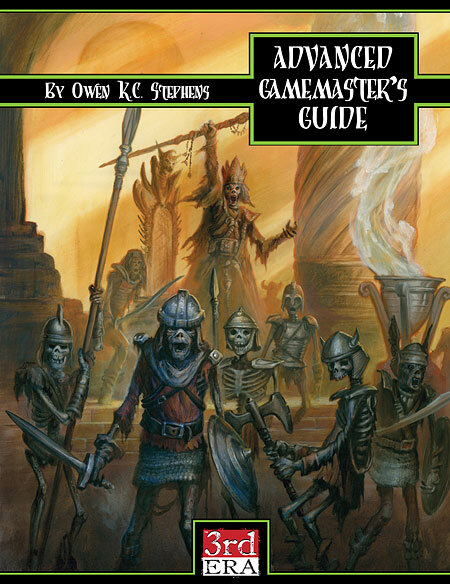 This book also includes ideas for running published adventures and a framework for building your own adventures and NPCs. Advice for improving the play area, such as using props, miniatures, mood music, and other helpful suggestions, while also addressing the best ways to take advantage of players' strengths and working with challenging play styles. Guidelines for changing the rules to make the game fit your vision. Options including class dodge bonuses, expanded critical hits, and quick resolution mass combat are all ways to make your game exciting and unique. Ways to speed up play such as set damage and criticals, simplified attacks of opportunity and more. Ways to add complexity like fortune points, variant spell systems, and experience debt. Character options including variant power levels, character backgrounds, building resources for downtime between adventures, and alternate methods for advancing characters such as vision quests and advanced training rules. Fantastic treasure including mundane item materials, to new armor and weapon qualities, and all new magic items such as boons, chakras, and levin. New poisons, diseases, and conditions like enamored and bewildered. New mechanics for mystic locations and unusual environments like the dreaded transstorm. Sample initiative cards and a campaign worksheet for recording your game changes. Cool illustrations from top artists like Kent Burles, Lisa Wood, Joseph Wigfield, Toren "Macbin" Atkinson, Terry Pavlet, and James Smith III. This excerpt from the AGG features rules for creating magical artifacts. Read along as AGG author Owen K. C. Stephens discusses house rules, and provides two: the bushwhacking rule and the class dodge bonus. Answers to frequently asked questions about Green Ronin Publishing's Advanced d20 Rulebooks. Check out this brilliant cover piece by William C. Eaken! The 3rd Era line of books and accessories was released in support of the third edition of the world's most popular roleplaying game, which lives on in the active play of game groups around the globe and in many variants supported by third party publishers.